Order 1 or more 65lb boxes of coffee and you will pay just $10 per box. Order 10 or more boxes (just 650lbs) and you can choose to have your coffee shipped to via LTL (Less than Truckload). Your coffee will be palletized for FREE and it will show up on a truck - perfect for your loading dock. If you order 10 or more boxes and you don't have a loading dock, you might want to ask for a truck with a Liftgate. You will pay a $25 handling charge, but it will be worth it. Try before you buy. Samples ship free. Genuine Origin will only ship coffee to addresses in the continental United States. Ship times vary by location. Our coffees are warehoused in Mechanicsburg, PA (zipcode 17055). To find your estimated ship time visit www.ups.com/maps. Orders processed after 2pm EST (with a ship date of today) will ship out on the next business day. 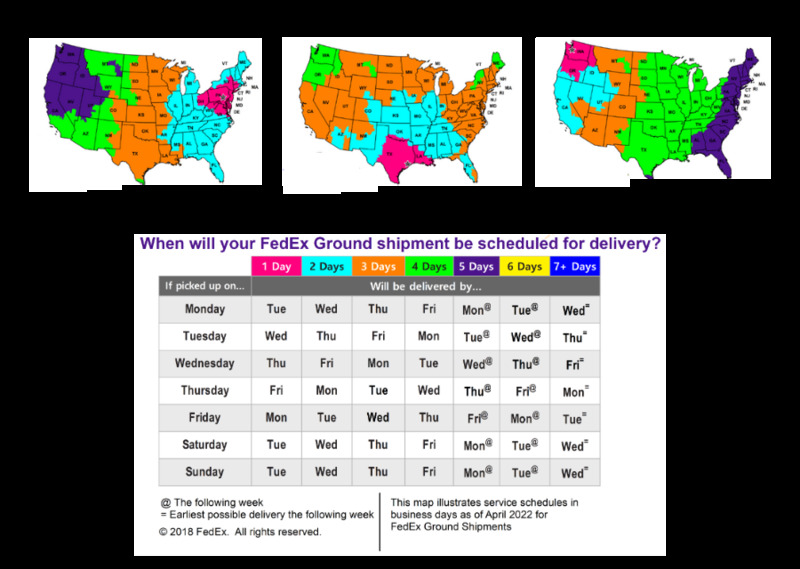 Pictured above: UPS Map with estimated shipment times in the continental U.S.